Check out these five films we’ve seen recently, four reviewed by Ellen and one by Richard. All are worthy of your consideration. The film is set in 1613, immediately following a fire which destroyed the Globe Theater. It opens with Shakespeare returning to his home in Stratford from which he had been long – and frequently – absent. The adjustment of his daughters and his wife to his return is difficult, and he is unsettled. The story of the last three or four years of his life unfolds, and while what is portrayed in the film is not all true, much of it is based on facts of his latter years. But these distortions matter little here as this film depends not on the story itself, but on the acting, the staging, and the filming, all of which are amazing accomplishments. An interesting note is that Branagh is a Shakespeare obsessive, and he created this film as a bookend for Shakespeare in Love (which we saw and indeed did love). In a way, the play is an elegy, yet it also provides a detailed portrait of a man of creative genius and his many personal flaws. And one final note: the film was actually released in 2018 so it could be considered for the Oscars. Somehow, it did not receive a single nomination. And that is true. Go see this. It’s brilliant. It is scheduled to be released May 10th. I am not sure how this film came to our attention, but we are certainly glad it did. It is Chinese-made and tells the story of a China we do not know. Perhaps it’s a side of any country not available to outsiders. Even though Richard and I have traveled extensively in China for the last 30 years on our own and with our Beijing and Guangzhou-based friends, we were seeing a side of China we had never seen before. This story was so unusual and so fascinating that about half way through I turned to Richard, at the same time he turned to me, and said, “this is absolutely fascinating.” And he agreed. This is the story of China’s contemporary gang culture and illegal underground activity. This is a story of rival gangs, of illegal guns, and of maiming, murder, and mayhem. It is also a story of romance and sacrifice. 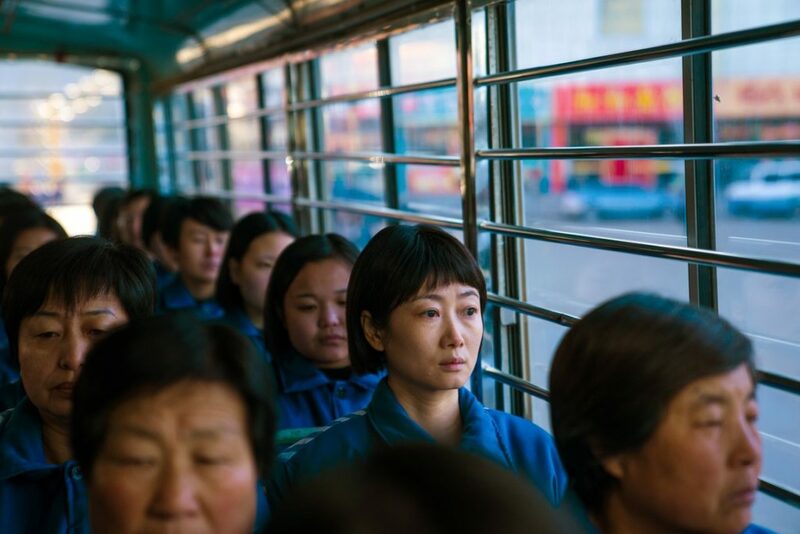 The film takes place over a period from 2001 to 2018 during which we see the main character fall from being a leading member of the criminal underworld in Datong, near Mongolia, to a broken, sick, and disrespected man. We see his girlfriend endure prison to protect him and survive that hardship to care for him, even though he no longer cares for her. The story is told in three parts that are well linked together. Ash Is Purest White is filled with scenes (and some places) familiar to us: small cafes filled with working men and women; men smoking and playing mahjong as a respite from their working in coal mines; a boat trip on the Yangtze before Three Gorges Dam is built, high rise modern office buildings, and drab uniformly built worker housing. Here’s a big box office film that really worked. It’s a not a great film, but it is one Hell of a good movie. Batten yourself down and imagine a film of unrelenting tension and drama and prepare to either close your eyes or to cover them at any second. 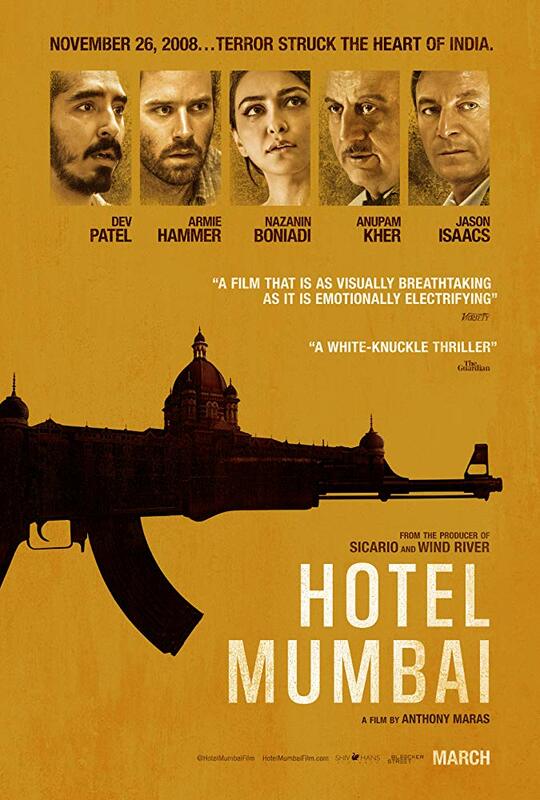 This movie tells a fictionalized account (barely, I think) of the horrifying incident of the November 2008 terrorist attacks on the city of Mumbai, India by Pakistani Jihadists. Ten members of an Islamic terrorist organization organization based in Pakistan carried out 12 coordinated shooting and bombing attacks lasting four days across Mumbai, including the world famous, elite Taj Mahal Hotel. The movie graphically presents the indiscriminate murder by the terrorists of innocent people at a train station, various prominent hotels, a Jewish community center, a hospital, and a café. A leader who was present only in their headsets encouraged them in their mayhem and guided the terrorists in their carnage. And horrifying it is. It is based on a Surviving Mumbai, a documentary, and while this movie was a fictionalized account, it rings true. (I am tempted, but I don’t think I can bear to watch the documentary account.) Watching this film is a sobering experience. Its horror is only lightened slightly by members of the staff of the Taj Mahal Hotel who risked their own lives to save those who were held hostage there. This is not a movie about the acting (good, but not amazing), or the production (stunning at times), but its success is due to the screenplay and direction of the action. It was so well paced to create tension and uncertainty of the outcome that I’m quite sure that I didn’t take a breath from start to finish. I was exhausted by the end of it. You’ve been forewarned. But see it if you can. This documentary is an example of why we enjoy being members of the Sunday morning DC Cinema Club. Had we only read a description of the film, it’s unlikely we would have seen it, and therefore we would have missed a film of considerable importance and enjoyment. The story is about the first all women’s boat to participate in the Whitbread Round-the-World Yacht Race. The year is 1989, and the race is a beyond dangerous and grueling around-the-world challenge of 32,000 miles. It takes six to nine months to complete. 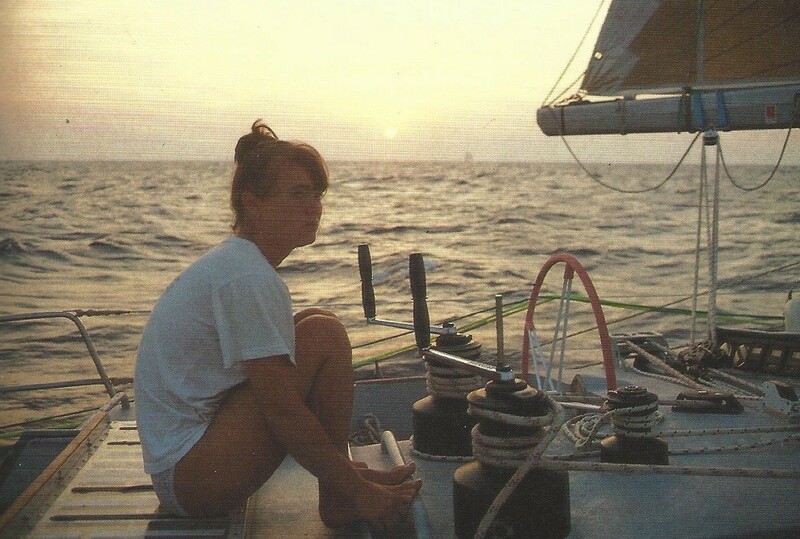 It is the story of the grit and determination of one woman – Tracy Edwards (awarded the Yachtsman of the Year, the first woman ever to receive the award) — and her determined and skilled crew. She and her crew faced incredible odds, first even imagining they could participate in the race, to finding financial support. They faced ridicule from the press and other yachtsman; and no one thought they would even complete the first of the five legs of the grueling race. The one thing that wasn’t difficult was finding competent women with sailing experience. Edwards was doing this initially for herself to prove that she could, but in fact, she and the crew eventually realized, they were also doing it for all women — to prove their competitiveness, toughness, and stamina in this all male sport. Woven into the narrative were recent interviews of many members of the crew who offered reminiscences and reactions from their achievement. This added tremendously to the quality of the film. The impact of the documentary comes in large part because of the incredible footage that was made at the time. The boat had a fixed camera on it, and one of the crew members took responsibility for additional photography. In addition, the documentary includes aerial photography, along with video and interviews from on-site TV coverage. For those watching, the tension wasn’t just about whether the team won or lost the race, but also about the skills and fortitude of the sailing crew and the breakthrough for women. Our enjoyment of the film was further enhanced by having one of the crew, Dawn Riley, present Sunday. She talked about the race, the crew, answered our questions about the film and indicated that their involvement has had an impact (positive) on the participation of women in yacht racing. The film will be released June 28, 2019. Put it on your list and go see it. For sure, we will take our granddaughter and grandson to see this inspiring documentary. I most likely would not have seen this film if I had not been invited to a pre- festival screening of it by a new friend who is the Director of the DC Asian Pacific American Film Festival (Coming up May 31-June 2, 2019). But I’m glad he invited me and that I went. It’s delightful. Fun. Entertaining. And the story is a universal one, with perhaps a twist of an ending. It’s a romantic comedy that pleases. Handsome, rich Asian man invites his NY Asian girlfriend (who somehow does not know about his background and comes from a very different economic and social background herself) to attend his best friend’s wedding back home in Singapore. You can almost imagine the story. She’s amazed. His mother is dismayed. He’s caught in the middle. She’s stunned by what she sees, learns, and experiences. I’ll leave the unwinding and conclusion of the story for you experience on your own if you see it. The film comes from a book of the same name, and we were fortunate to have the one of the screenwriters, Adele Lim to talk about the film and answer questions following the screening. 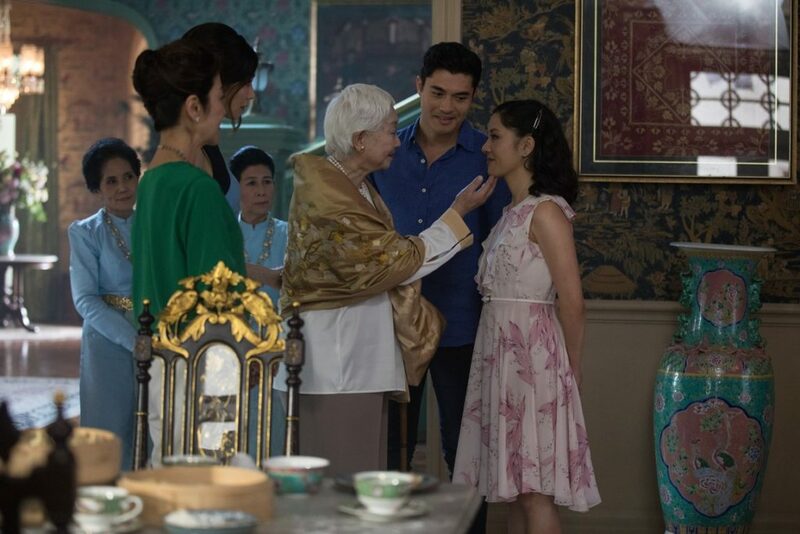 The largely Asian audience gave the film and Lim an enthusiastic reception. Not only is the story well told, even if familiar, there are good performances, and the scenery from Singapore made me want to get on an airplane to see the city for myself. Plus, there’s the food. Dumplings and dumpling making (flashes of our own Chinese dim sum preparation at Thanksgiving here in DC for the past 40+ years). For a satisfying outing, see Crazy Rich Americans and then find a good dim sum restaurant in your area to ‘top off’ the afternoon/evening. (Note: Crazy Rich Americans won the Critics’ Choice Award for the Best Comedy, Jan. 13, 2019 and was nominated for a number of other awards, including a Golden Globe for Best Motion Picture – musical or comedy. It has an all Asian cast and was produced in Hollywood. The 33rd Annual Washington International Film Fest is coming up (April 25-May 5), and the program looks very good, including many films we haven’t seen or even heard of. Check it out – 80 films from 45 countries over a period of 11 days.